Creating the perfect storm for Philips OLED Ambilight TV | What Hi-Fi? [Sponsored] Armed with 6K cameras, we risked life and limb to film the stunning storms of middle America in glorious HDR. "Don't get out. Do not get out." Instructions don’t come clearer. And when they’re issued by long-time storm chaser Stuart Robinson, they’re instructions you listen to. Rather than brave grapefruit-size hailstones and the possibility of instant extinction courtesy of some vicious bolts of lightning, the five-strong crew keep the doors of their off-road vehicles firmly shut. Given the dangers, you might wonder what five (mostly) sensible people are doing, deliberately, and repeatedly, putting themselves in the way of some of the most energetic, spectacular and dangerous storms on the planet. Crammed into their vehicles alongside stacks of cutting-edge camera equipment, the crew is filming nature at its most destructive. 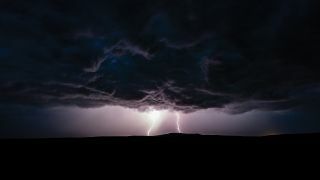 They’re capturing the spectacular storms of North America to create a film fit for Philips’ 2019 range of premium OLED Ambilight TVs, including the audio necessary to make the best of the company’s new partnership with Bowers & Wilkins. It’s not easy. The team arrives in Denver on an overcast Sunday and—after a morning kitting the cars out with enough weather equipment to send Michael Fish into shivers of ecstasy—they embark on a 4,500 mile trip that takes in nine states, from Montana with its frigid Canadian border to Texas with its Mexican crossing some 1,000 miles away. Storms are the name of the game. To that end, Robinson parks himself in the passenger seat where he spends his time poring over weather predictions on his laptop. Thunderstorms typically strike in the afternoon and the days soon develop a rhythm. Mornings are spent plotting routes and planning journeys often hundreds of miles long, as nascent storms gather above. Robinson and camera op Alister Chapman form the perfect team, pitching potential directions and weather updates at each other on the fly. The afternoons run at a different pace. With a likely storm located, the crew finds a nearby spot and waits for it to develop. The decision to chase comes at a moment’s notice and what follows is frantic. Entry routes are planned and escape routes are considered. “What’s in there are hailstones that will destroy a car,” says Alister. “You could lose windows, you could lose equipment off the outside of the vehicle,” agrees Stuart. A storm of particular violence in South Dakota sees the crew take off down dirt tracks, where they hope to find a good angle to shoot the storm without suffering hundred mile-per-hour winds. “Storms often move at about 40 miles per hour,” says Stuart. “So driving at 50 miles per hour means you’re only pulling away very slowly.” That means every stop for filming lasts five minutes at most. This is a time of tense work for the team, who deploy film cameras, a robotic timelapse slider, stills photography tripods and associated cameras, lenses and lightning triggers (which automatically trigger the shutter when lightning strikes), only to have to get them all, safely and swiftly, back into the cars moments later. All of this achieved in perfect synchronicity on the side of roads ferrying locals away from developing storms. An enormous amount of work went into getting Extreme Earth 3: The Storm into shape. But with the reproduction on offer from Philips’ 2019 TVs so spectacular, it had to be perfect. The flagship 55-inch OLED+903 Ambilight TV is the set for the job. It’s one of Philips’ first TVs to offer HDR10+, which is handy since The Storm was shot and edited in HDR. That said, the 903 also handles non-HDR material just as well thanks to its Perfect Natural Reality contrast engine. This engine—which is part of Philips’ new 2nd generation P5 processor—means everything the TV displays has increased quality, sharpness and contrast. It’s only when the team settles in to watch the film that the quality of the TV becomes truly clear. Colours are bold and vibrant, while HDR technology makes the most of the enormous dynamic range of a storm. That, coupled with OLED technology, means storms look their brooding and terrifying best, with deep blacks offset by blinding lightning strikes and deep blue storm clouds. Meanwhile, the film’s composition—done with Ambilight in mind—ensures the storms’ colours bleed off the edge of the screen onto the wall behind, creating an immersive, captivating experience. Storms aren’t just visual, so the OLED+903 Ambilight TV doesn’t pack your run-of-the-mill TV speakers. An alliance with Bowers & Wilkins means startling clarity as well as deep, thumping bass unheard of in a TV 50mm deep. The film comes together beautifully. There’s evocative sound, gorgeous, dramatic pictures and—perhaps most impressively—not a single crew member was harmed. Both cars returned at the end of the trip more or less intact, albeit with the remainder of 4,500 miles’ worth of snacks in the footwells. Road trips don’t come much more epic than that. Click here to learn more about the Philips OLED+903 Ambilight TV.